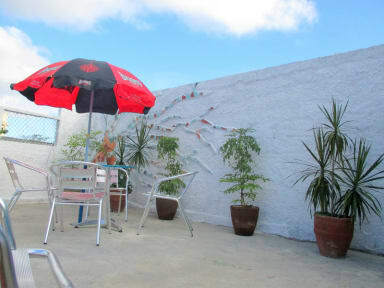 Hostal Doña Ari is located in the center of Santa Clara, just 50 meters from Parque Vidal. Our two large and airy terraces are a great attraction, where you can enjoy excellent views of the city, especially the central square, surrounded by buildings from the 19th and 20th centuries full of history and traditions. We offer you breakfasts and dinners, with a wide variety of traditional Cuban meals and international cuisine, exquisite dishes with detail and typical flavours that will make you feel enchanted with our menus. The cocktail bar is also one of our offers that you can enjoy on the comfortable outdoor terraces. For your greater satisfaction and enjoyment, we offer you massage services with experts in the matter that will make you release all the stress and feel relaxed and free. Hostal Doña Ari is located in the center of Santa Clara, just 50 meters from Parque Vidal. Heart of the cultural life of this city, where you can find the main shopping centers, theatre, cinemas, library, nightlife and cultural centers, restaurants, cafes, bus stops, museums and galleries. These and many more just a few steps from our house. 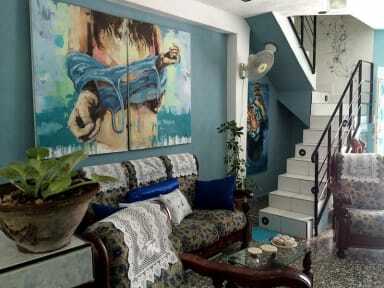 This beautiful residence presents an eclectic modern style, artistically decorated with striking and beautiful works produced by one of its hosts, who is a professional artist, where excellent aesthetic taste prevails. It has two spacious rooms with individual bathrooms where you will find great comfort and hygiene, the ornamentation of the same invite you to feel relaxed in a cosy and safe, with open spaces decorated with magnificent works of art. Check in from 09:00 am.